Abandoning that jacket has done wonders for my sewing mojo - in the last few days I have I sewn a new dress that is just in need of a hem (which I need buy a new twin needle for) even though it wasn't one of the fabrics I had in the photograph in the last post. It was just one of those random spur of the moment choices which I think has reignited my love affair with sewing - being able to sew what you want is great! Plus I have already pinned up my next project which is one of those in the photo from the last post (yeah I'm really lame at sewing with a plan!). I've popped out so much earlier than last time - I'm nearly 14 weeks now and already my normal clothes are way too small and the belly has almost gone from that 'had too much to eat' look to a definite baby bump. Of course it doesn't help that I always sew my clothes with the closest fit possible because there's not much room in them for expansion. This dress which was luckily made from a stretch cotton sateen was bursting at the seams when I took this photo two weeks ago and has now been put away for the foreseeable future. Morning sickness this time round has been far far worse than last time too - I am still having a close inspection of the inside of toilet every morning even now at 14 weeks. In fact it's been such a frequent occurrence that Anna's new pretend game is to yell out "I sick mummy" and then run into the bathroom, lean over the toilet and make a very realistic vomiting noise. Oh dear, I hope she forgets this one soon! Plus I've been so exhausted lately, which is normal but made even worse having a toddler to run around after. That is the main reason behind my lack of productivity of late, it has been way too hard to drag myself off the lounge each evening. So you can expect a bit of maternity sewing around these parts for the next 6 months. 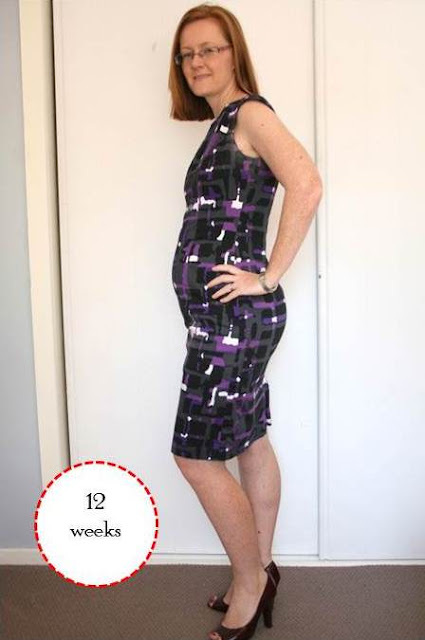 I really enjoyed the challenge last time of adapting non maternity patterns, although lately Burda has been quite helpful in offering up billowy shapeless styles in the magazine for the last year which will be great for maternity styles with very little adaptation. Plus there are a few other bloggers who are currently maternity sewing too, in particular Kitty Couture whose style I love and I'm sure I'll get a lot of inspiration from even though she is in a different season to me. And now I need to brave the fabric store tomorrow to buy that new twin needle, hopefully I can escape without buying more fabric because I have my eye on some more shoes instead! 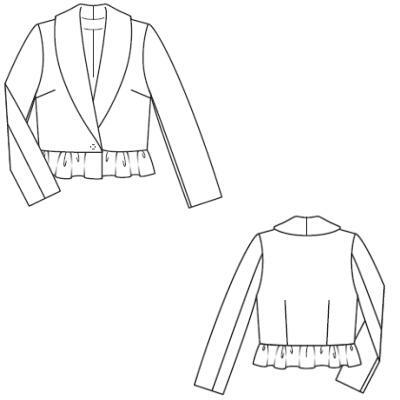 but before I sewed on the ruffled peplum which would have been the final step, I tried on the jacket after sewing in the sleeves to insert the shoulder pads. And the fit was appalling! My fault of course for not making a muslin, but I've sewed several Burda jackets before and have found that a size 36 is a good fit, plus I did flat pattern measurements which seemed ok. But once it was sewn I could see that back was too broad, the shoulder seam too wide and generally just a little too big overall. All fixable of course, but it would require unstitching quite a few seams but unpicking black thread on black fabric with the added fussiness of block fused whisperweft interfacing is a task that I was just not up to at the moment. So sadly I have broken my self imposed no new UFO rule which I have adhered to for the last 2 years. But KayY's comment that sometimes the right garments are just started at the wrong time resonated with me, so I'm considering this one a 'seasonal' UFO and will put it at the top of my to do list next winter. To even things out I pulled out a summer dress from the UFO box while I was putting this one away, and have already started working on pulling it apart to re-sew and finish it. So all is well with my little universe. So expect to see some colour (and finished projects) around these parts soon! from a piece of black wool melton that I happened to have in the stash. I actually started it over a month ago and haven't sewn a stitch yet. It's progress was interrupted by making Anna's dress for my grandfather's funeral and my sequinned jacket for the party (both necessities), but really I've dragged my feet on all the steps so far: steaming the wool and pretreating the interfacing, cutting out the pieces, block fusing all the pieces and marking the darts - which is where I'm up to now. This would have been a lovely jacket worn over all those colourful summer style dresses I made during winter and that is the real problem. It's spring around here now, and we are having glorious sunny days, so my brain is telling me I don't need a cozy jacket made from wool melton no matter how cute! So every time I go into my sewing room instead of sewing I've been going through my stash picking out lovely cottons and linens for summer sewing, flicking through my patterns and - the ultimate sign of procrastination - cleaning up the sewing room! These sparkly Seed shorts in an oh so flattering boxer short style, available for the bargain basement price of $249.95. Oh that's right, I have lost my willpower not my mind! But jokes aside, if you look closely you can see these are constructed with a silk underlayer, and the sequinned layer is a separate outer layer which is a good way of dealing with the scratchiness of sequined fabric. Ah there are lessons to be learnt everywhere we look. Mysummertouch - I too thought that to sew sequinned fabric you needed to cut the sequins off from the seam allowance, but I tried just sewing over this fabric as normal on a scrap bit and it worked just fine. I did break one needle when I went too fast, but by going a bit slower it sewed together like normal fabric and the seams pressed flat. I think it's because this fabric is actually tiny little metal rings, instead of small metal discs like traditional sequins, so the needle was able to sew in between and in the middle of the rings. I'm glad it worked out like that, because cutting out the sequins from the seam allowances sounds pretty tedious, and I probably would have procrastinated on this one too! Samina - I am not really a fan of sequinned garments either, and in fact when I was in the fabric store I was actually looking for a nice embroidered silk or some other textured colourful fabric when this caught my eye. Again I think it's because it's not the traditional large, reflective sequins in gaudy silver or gold ( or red shudder) but is a little more subtle.... I hope. 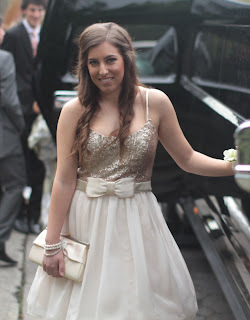 Vicki - how could I have forgotten Sofie's formal dress? It is the perfect balance of fabrics and colours. I wish I had worn something with that level of style to my formal instead of the black sheath dress I wore (thinking I was uber cool). In the end it didn't matter, because the cake tasted fantastic (how could it not with that much icing on it!) and my husband was very surprised and happy because it's the first time someone has made him a themed birthday cake! I cannot believe that he escaped childhood without a train birthday cake or some other creation from the Australian Womens Weekly birthday cookbook (the most famous book for cakes in Australia). Actually I find it a little sad, as I have lots of memories of my birthday cakes from when I was little, but perhaps the Chinese don't go over the top the way that some of us do! We had a small party for about 50 people at a local restaurant for him and his best friend who was also 40 a few days earlier, so of course I needed something new to wear. I decided to make this sequin jacket from Burda 7/2011, model no 101. It's a number of firsts for me. Firstly, not only did I make something from the Burda magazine within the same month I received it, I actually made this about 2 days after it landed in my mail box. Now if only I could do that each month I could fully justify the purchase. I made a minor change to the pattern cutting the back piece on the fold instead of having a centre back seam. I couldn't work out why there was a centre back seam at all because the pattern doesn't provide for any shaping along that seam, so I figured it was best to have as few seams as possible since I wouldn't just be able to overlock the edges as usual. 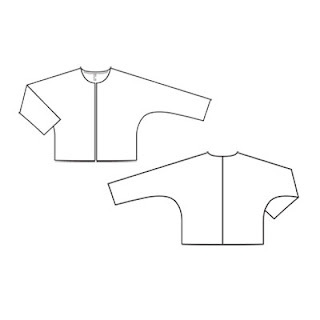 I would have liked to have also eliminated the shoulder to cuff seam by cutting it out as one piece (therefore only having the side seam and underarm in one long seam), but my fabric wasn't quite big enough to do that. But surprisingly the sequin fabric pressed quite well so the seam sits flatly. It is quite shapeless, but it draped nicely almost like an itchy heavy cardigan because of the weight of the fabric. 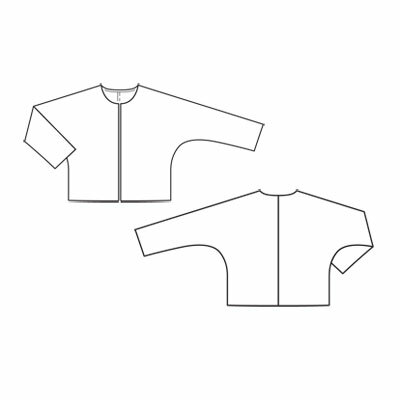 I left this unlined as per the pattern, but I might go back and line it because the fabric is a little scratchy against bare skin, and I found that without a solid foundation like interfacing or lining the neckline stretched out a little and the jacket kept sliding off my shoulders due to the weight of the fabric. Although a closure at the front might help keep it on too. We'll see, I'm usually quite bad at going back to fix something once it's made and worn, and who knows when I'll be wearing a sparkly jacket again! On the inside I bound the seams with sheer grey organza strips which on the one hand turned out well because they are almost transparent, but on the other hand the organza is fraying a bit because I was too lazy to double fold the strips so that the raw edges were on the inside. Live and learn. I wasn't sure if this fabric would fray, but I was worried that the sequins might start falling off near the cut edge and plus they were a little sharp in places so it was good to enclose them. For the neck facing I used strips of the selvage, and for the front facing I just cut the pattern pieces out with the front edge lined up against the selvage so I could just fold it under twice and hand stitch it down. This worked out well, because if the jacket flipped out a little the facing wasn't too noticeable because it was the same colour as the inside of the jacket anyway. So for such a simple shapeless little jacket I actually rather like this. It's totally unlike anything else I own, and is by the far the sparkliest thing in my wardrobe but it's good to break out of your usual style sometimes and try something new I think (especially if your look is rather classic and somewhat sedate like mine). Plus I can see me wearing this with dark denim jeans and heels for a more casual look, so it may be versatile than I would expect from a sequined jacket.